Python Developer Salary: What Factors Affect Outsourcing Rates? Python Developer Salary: Do IT Pros Make $116,000 a Year? Beginners to coding choose a particular language to study from the perspective of how much money they will earn. Python developer salary is of great interest for both newcomers and pros. It might be a subject of concern for those who try to figure out what factors affect the cost of Python software. role and in your area. How Popular Is Python Among Customers and Developers? A recent TIOBE index shows that Python’s rating increased in February 2018 as compared to the position it took in the same month 2017. It is forth among the most popular programming languages. It is loved by many programmers as it has less code lines. Clear syntax facilitates agile development. Customers can get their products faster and for less. Global companies like Google, NASA, Disney and a lot of others have already appreciated the technology. Python is the primary environment to manipulate and clean data. Data scientists level up Python programming skills to write their own functions. The demand for Python programmers skyrocketed due to a lot of new technologies like IoT and machine learning. Life becomes smarter. Things around us become smarter as well. To meet today’s challenges people are using computer science nearly always. Programmer wages are growing whereas the requirements of jobs for Python coders are becoming rather tough. - suitable for solving mathematical problems (a means of working with complex numbers, can operate with integers of arbitrary size, a dialog can be used as a powerful calculator). However, Python still has some disadvantages. Like many other interpreted languages that do not apply, for example, JIT-compilers, Python has a common drawback - the relatively low rate of program implementation. In addition, the lack of static typing and some other reasons do not allow you to implement a Python function overloading mechanism at compile time. Python has a large standard library, commonly considered as one of Python's greatest strengths, providing tools suited to many tasks. This is deliberate and has been described as a "batteries included" Python philosophy. What Is Python Developer Salary in the United States? You may wonder how much software development costs in different countries of the world. Let’s start exploring the USA. According to Indeed, $116,000 is an average Python programmer annual salary. The experts have analyzed the information got from almost thirty thousand pros who submitted their wages anonymously. The lowest figure in the distribution is $44,000 whereas the highest is $221,000. It’s worth mentioning that the wage rate depends on the level of proficiency and expertise, no matter what job you are doing. That is the reason for entry level python developer salary being lower ($74,000 on average). To earn more a typical programmer has to gain a particular level of proficiency in the domain. Some employers use specially designed competency matrices to measure how skillful their workers are. These charts describe what software developers/programmers can do, what tools they use, in what languages code, etc. We’ve explored the status of Python coders in the USA. Here we go, Indian students haven’t got Python in their curriculum. Instead, they study Java or PHP. That’s the reason there are so few Python pros in India. As things stand, the average annual salary of Python coder in India is 482,000 rupees which is approx. $7,500. The experience of such programmers is less than 10 years. We’ve collected data on different websites to compare the wages offered in Python jobs advertisements in European countries. Below is a table. You might find it useful if you need to hire a programmer in Europe. As you see, the size of payments is almost the same. Keep reading to see how the salary is different in Eastern Europe. You might be surprised by how impressive the difference is. That’s the tip you can use if you need to cut costs. What Other Factors Affect Python Engineer Salary? While choosing a developer for your project or while applying for a new job position as a developer, you both should know about the most frequent factors affecting developers rates and salaries. We have collected the major factors that can help you hire employees effectively or write your CV properly. Dice specified the locations where Python engineers earn higher wages. New York is number one in the list. It is followed by 4 American places: Silicon Valley, Dallas, Seattle, and Chicago. Top companies engaging people qualified in Python include Amazon, Apple, Oracle, Google, IBM, Microsoft, etc. As you see, those are global corporations that everybody would like to work for. 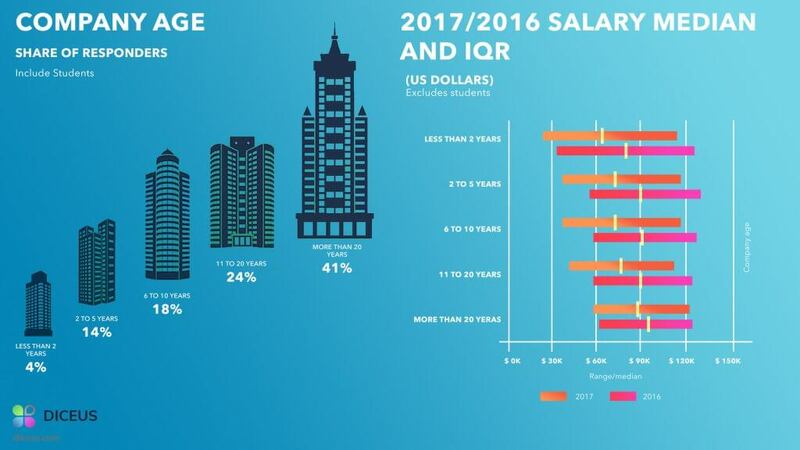 According to O'reilly's annual report on developers salary, large companies pay higher wages to their employees as compared to small and middle companies. The research demonstrates that this year smaller companies tend to lose salary traction (-15% approximately). It is also explored that companies working more than 20 years pay more than those who work 2-5 and 6-10 years on market. And it’s a little bit surprising that the companies who have 11-20 years of experience pay less than those who work 6-10 and 20+ years. Take a closer look at the chart that compares the distribution of salaries in 2016 and 2017. The salary of developers depends also on the industry in which they work. 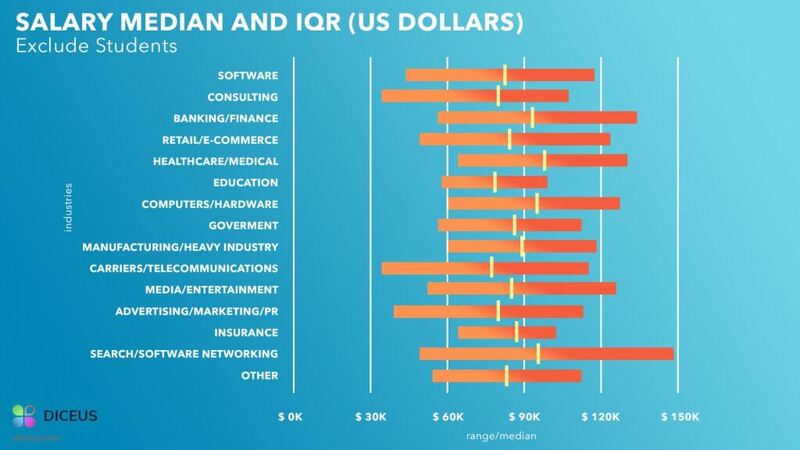 The chart below shows that programmers draw higher salaries in search and networking sectors. Banking and finance are second to pay high for development. A lot of females with brilliant minds were involved in computing. Just remember, Jean Bartik or Grace Hopper. They were first brainy women who devoted their lives to software development. It’s no coincidence that a lot of female coders are currently working all over the globe. However, the percentage is too low. Only 8% of women are engaged at development work. They earn approximately 10,000 less than male. The age of programmers affects the volume of the salary. The report shows that people who are 40-50 years old earn much more than those who are younger than 30. 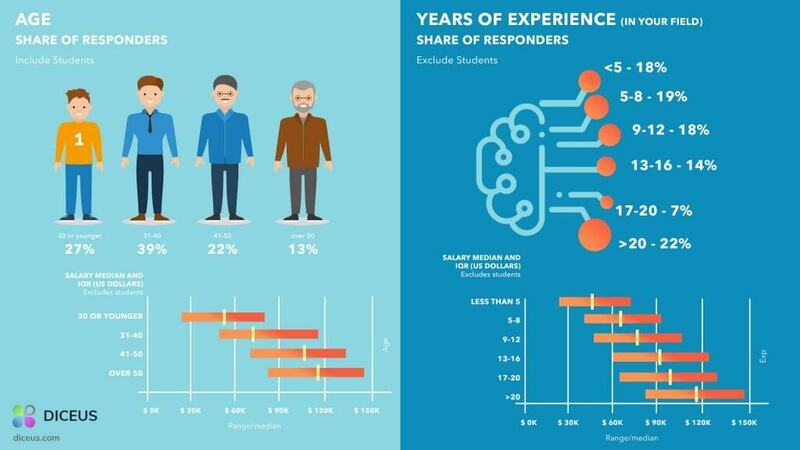 We mentioned that experience is one of the major factors influencing the wages. It is confirmed with the data presented in the report. Experts with 20-plus years of experience get on average $120,000 a year whereas people engaged in IT for 5-8 years earn around $75,000. It’s twice less. To sum it up, Python programmer salary depends greatly on region and place of employment. Apparently, small and middle-sized companies pay lower wages as compared to average salary in Google USA, for example. The highest paying languages are Scala and Go with median salary of $110K. There are different lists of top paying coding languages in the Internet but they are pretty the same with the only difference in the sequence. Python developer is in the list of 10 most payable jobs in the software industry. 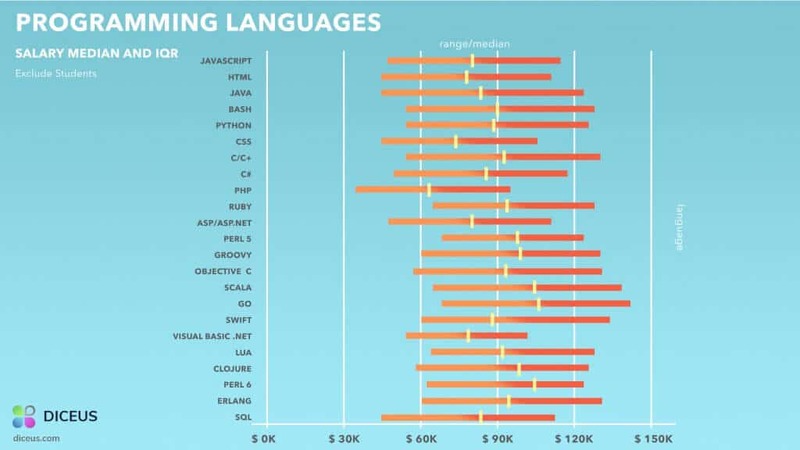 Here is a list that shows clearly the median wages of programmers who write code in different languages. How to Reduce Expenses for Software Development Regarding Python Salary? Salary reports define the rates of custom development. The highest paying countries offer the highest outsourcing rates. So, if you consider hiring foreign vendors look for the countries with lower wages. Take a look at the table demonstrating the difference in the average salary engineers in USA and Ukraine. This data is based on median annual indicators, as of 2017-2018. It's obvious that there is a stark difference between the two countries. That’s the cost that is critical for choosing Ukrainian developers. Long-lasting projects require massive budgets. Employing pros overseas can cut down your expenses. How Else to Benefit from Outsourcing? Usually, companies offering Python development overseas provide multiple services. Imagine, your team members build a sophisticated product whereas the other staff is working on the go-to-market strategy and promotion. This agile methodology provides fast results. It combines the efforts of a product owner and a team. Customers are able to observe the planning and sprints progress, no matter where they live. One of the key advantages of outsourcers is the availability of dedicated teams. You will deal with people who are used to work together for gaining common goals and business objectives. There’s no special guideline to adhere to when you look for professional programmers. Here is a couple of recommendations you can follow to choose the right developers' team. Ask candidates what they know about the latest news in their technology. What they say can show how good they are at following technology trends. Learn if developers are able to perform unit tests. Find out if they cooperate with testers and how fast they can fix the bugs if any. Figure out in what ways programmers cooperate with others. Speak about the workflow, what they know about the typical processes in their company, what difficulties they often meet, and how to resolve them. Problem-solving skills are of great importance for people working in the IT sector as they have to address different challenges every day. Discuss the work-from-home arrangements as currently a lot of IT professionals seek opportunities to telecommute. If you don't offer remote job opportunities, think of offering flexible hours. Tell the candidates if your company provides the opportunity to contribute to multiple projects. The matter is that most computer geeks don't want to be tied to just one type of tasks. You must be able to explain clearly what opportunities a developer has for career growth and development. Speak about the abilities to innovate. Your potential employees must be sure they will be able to offer new ideas and take part in decision-making processes. Prioritize your needs and ask us about Python projects. We will offer you transparent estimations and pricing according to your software requirements and specifications documentation and based on in-depth business analysis conducted by our specialists. We can combine the technologies which you require to use within the project and get a maximum of possibilities. Learn more about other languages on our website and tell us about your needs. We are here to help you manage your project efficiently.